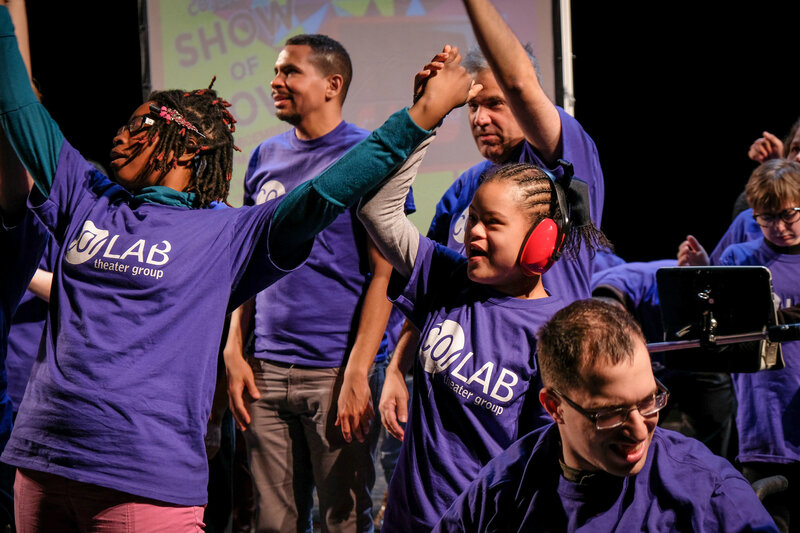 CO/LAB Theater Group is a non-profit organization that offers individuals with developmental disabilities a creative and social outlet through theater arts. We have two main legs of programming: CO/LAB:core and CO/LAB:connect. In 2016, CO/LAB engaged in a Strategic Planning process which resulted in a detailed three-year plan we would follow for calculated and sustainable growth. One of our overarching goals was to create leadership positions for our participants with developmental disabilities – our actors. This deepens the artistic engagement of some of our actors that have been with us for years who were clearly ready for the next step. In addition, it is CO/LAB’s responsibility to join and participate the national conversation & calls to action about representation of people with disabilities in the performing arts. With those goals in mind, CO/LAB started the Leadership Initiative – a program in which our actors are leaders in the classroom. Our Leadership Initiative provides training, volunteer, and employment opportunities for people with developmental disabilities. Veteran CO/LAB actors are hand-picked by our Director of Programming based on specific criteria. These actors then are eligible to be volunteers in our CO/LAB:connect program or paid counselors in Camp BlueLAB (our summer partnership with Bluelaces Theater Company) and in our CO/LAB:core weekly class, CO/LAB:kids. The Leadership Initiative actors check in with our Director of Programming each semester to discuss progress and areas of growth. You can see our actors speak about it here and here! CO/LAB also developed an Advocacy Committee – a committee in which some of our actors and parents join Board & Young Professionals Board members in the organization’s thought leadership. Our Advocacy Committee has various strategic conversations about community engagement, internal CO/LAB communications, the impact CO/LAB has had on them, and their dreams for the organization. This helps CO/LAB staff understand what is important to our community at large and make concerted efforts to take next steps based on their guidance. When MAC was developing the Supporting Transitions program, CO/LAB was a case-study as an organization that was working to employ individuals with developmental disabilities. It is both CO/LAB’s and MAC’s goal to create meaningful employment and volunteer experiences for adults with developmental disabilities. We are honored to be connected!